Aperlite are a new name in the world of photography. I for one had never heard of them until they sent me over one of their flashguns – the Aperlite YH-500C – to review. Along with Yongnuo, Aperlite seems to be breaking into a market previously dominated by Canon, Nikon and a few other big name brands. Originating in China both of these companies are taking on the established companies by selling similarly specced flashguns at a fraction of the price. Part of their strategy seems to involve selling exclusively through online portals such as Amazon and Ebay and doing practically no marketing. The Aperlite YH-500C can be found for £45.00 whereas the Canon and Nikon equivalents retail for close to £200.00! At that price there must be a catch, right….? Well we’re about to find out. The Aperlite YH-500C (C is for Canon and there is an N for Nikon) arrived in a nice presentation box which contains the unit itself, a plastic stand, fabric carry pouch and instructions. First impressions are good although this is tempered by the fact that the pouch fabric is very thin and although gives protection from scratching, would not protect the flash from any kind of impact. The branding on the unit itself is a touch old fashioned and is the only visual clue to suggest that this might be a budget item. The instruction booklet is a little thin and written in what I call ‘Chinglish’ – something I’m familiar with as a son of Hong Kong immigrants. This does not fill you with confidence and the instructions are not as detailed as a Canon/Nikon one would be. However at this stage you’re still struck in awe at the £45.00 price tag and so are prepared to play along. The plastics are good quality, not as plush as a Canon/Nikon but decent enough. There is a similar story with the switches and buttons – in direct comparison with the big brands they might seem a tiny bit inferior, but do they feel 4 times cheaper? Definitely not! This unit supports E-TTL with an option to compensate in 1/3 stops. It also has a manual mode and two Slave options for shooting off camera. Manually set – power output ranges from 1/128th full power in many increments up to 1/1 or full power which provides good flexibility. 2nd curtain sync flash for shooting light trails etc. Recycling at full power takes 3 seconds which is class average. And there’s an auto cut-out to prevent melt down. I tested it quite extensively and it didn’t cut out once. It has a wide angle diffuser and a pull out plastic card for putting catchlights in eyes and filling in when bouncing the flash off the ceiling. With a guide number of 58 the Aperlite on paper is identical to the Yongnuo 565EX I was testing it against. However one thing I did notice from testing it was that if anything the Aperlite was down on power. The below images were taken in the exact same manner and it would appear that the Aperlite is not as powerful as the 58 guide number would suggest. On the downside, testing side by side with my Yongnuo 565 EX, shooting identically the Aperlite (despite sharing the same 58 guide number) was down on power – in my estimation by one stop. A padded carry pouch would provide better protection too, especially when they are thrown into kit bags in a hurry. Cosmetically the lettering on the actual flash could do with some modernisation but that is nit-picking really. On the positive side it is well built, well featured with E-TTL, 2nd curtain sync etc., and excellent value for money. It has been criticised elsewhere for not featuring high speed synchronisation – but at this price point that would seem a bit harsh. And besides my 565 also does not have that feature. At the end of the day this is a mid range product and you would have to spend a bit more to get that feature which I think is fair enough. Overall I would be inclined to stick to my Yongnuo system purely for the advantage in power. 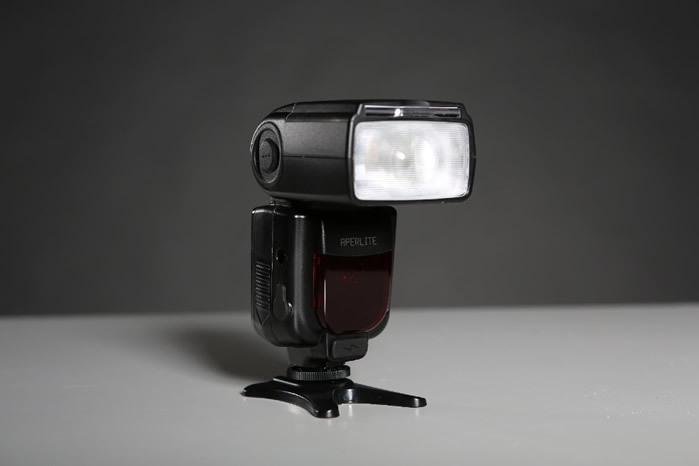 The Aperlite is, however still an excellent product and with a few tweaks addressing the power issue, a better instruction manual and slight cosmetic upgrades it would be the equal of the Yongnuo product. The bigger message is a warning to Canon, Nikon and the bigger brands. When companies like Aperlite and Yongnuo can deliver products which have 90% of the capabilities of the more expensive units at 1/4 of the price then I can see people heading into their arms en masse. The price difference to many people is a no-brainer. Furthermore if you are interested in using multiples of these as a mobile, wireless studio set up, for around the price of one Canon/Nikon equivalent you could buy 3 of these units AND the stands and bits and bobs to convert into a nice little mobile studio. Doing the same with Canon and Nikon would practically cost the same as a reasonably priced 3 headed electronic flash studio kit. It will be interesting to see what reaction, if any comes from the big players. Firstly it takes the standard 4 AA batteries. It also has provision to connect to an exterior power pack. Battery Life: 100-1500 flashes approx.